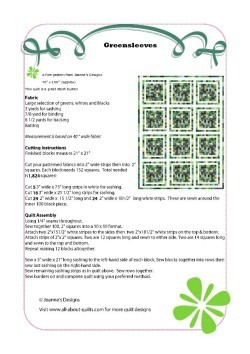 Joannes Designs Week1 Greensleeves was a quilt I made several years ago (2011) while recovering from surgery. It absorbed most of my green fabric from my stash! Before you embark on making this quilt I'd advise you to decide on the bed it was to go on or you could find you have an enormous quilt on your hands like I did. Alternatively you may choose to make an 8" x 8" block centre. When I shared the finished quilt top with my quilting group they all commented on how large it was! At the time I hadn't really considered how big it was, so take extra care when you make yours! If you have the EQ quilting software or similar (pencils & paper would do) play with the design using different colours, as well as different types of borders on the blocks. 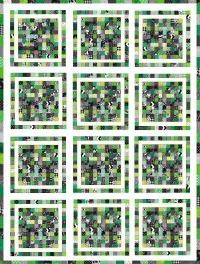 To make this quilt you will need quite a large number of 2" x 2" squares in whatever colour-ways you choose. The quilt is made from 12 blocks each measuring 21" x 21". To be able to add the second coloured border of 2" squares you need to remember that the white border between needs to be constructed also from a 2" wide strip. For the sashing I chose to use a 3" wide white strip. This gave enough definition between the blocks. 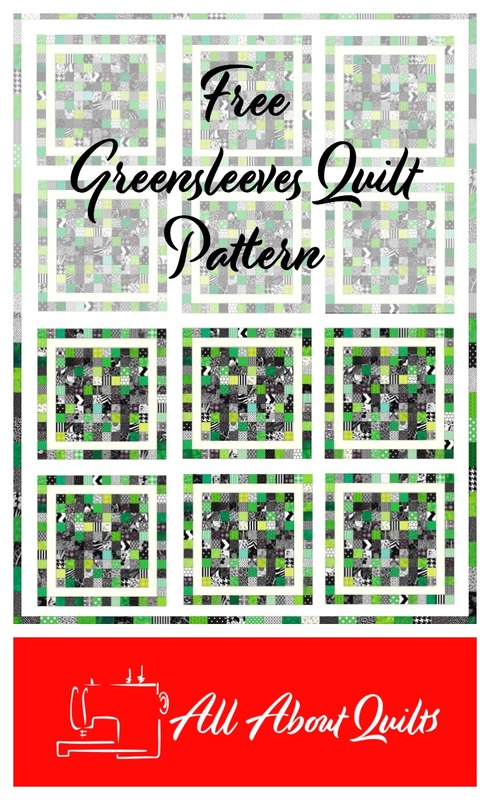 Click on the pattern Greensleeves Joannes Designs Week1 below to download a full size printable version in PDF format. When making this quilt I found using my rotating cutting mat most helpful to square up each block without having to move the block around my table. There are some quilting supplies that though expensive pay for themselves over and over again (reducing frustration, inaccuracy & time) & this is one of those! 1. Make all the central blocks containing the 100 squares first. This can be done quite quickly by chain piecing. 2. Remember to iron each rows seam allowances in opposite directions so that your seams line up well. Take care not to over stretch the rows. 3. Attach white border strips to all blocks. Then add the last border of 2" squares to all blocks. 4. Begin attaching the 3" sashing, completing one row at a time. 5. When sewing on the long sashing do a quick remeasure to confirm the correct length for them. I found this quilt quite easy to tweak/fudge when aligning the seams. 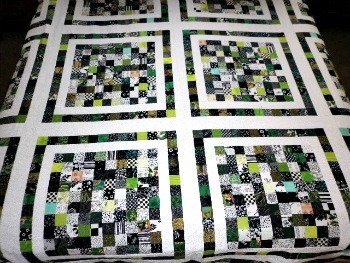 Below is a photo of my Greensleeves quilt top laying on a queen sized bed. It has yet to be made into a quilt. I hope you enjoyed Joannes Designs Week1. Just 51 patterns to go!